Password is amongst the most important thing in today’s digitally driven world and coincidently, we lose it very often too! This password could be belonging to any given service; email, social networks, messengers, etc. However, email being the extremely frequent in usage amongst users, the segment talks about the same. PST files as we all know are the proprietary data files of Microsoft Outlook. The PST Unlocker is a program that works proficiently enough towards the removal of passwords. This review will be getting into the details of the same application in detail to find out whether it is worthy of investment and trust or not. The application deals with all sizes of data files while unlocking it from password protection. The application is built on advanced algorithms, which makes it capable of executing the entire method in an instant. However, there are many other additional facilities that contribute to a convenient working of the product. Following is a deeper look at the features portrayed by PST unlocker in order to help users open password protected PST files. Complete Reporting: The application claims to offer complete report of the PST files added to the application. 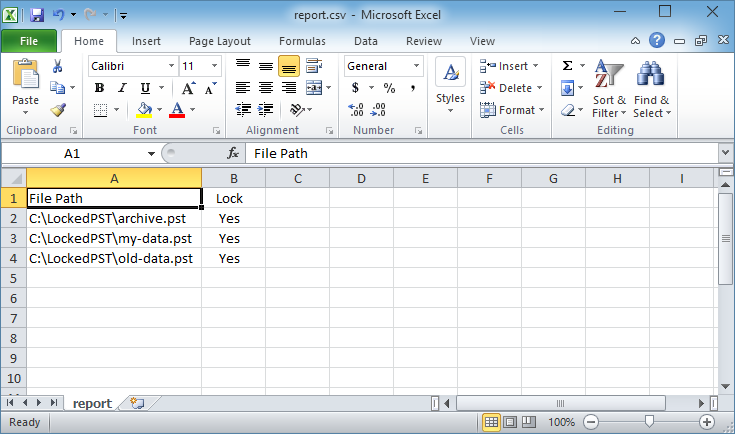 A report is generated by the application and can further be saved as a CSV format file on the machine for future reference. Although, the report does not portray much of information but does fulfill its purpose, i.e. letting users distinguish between protected and unprotected PST files. Unlocking PST: Adding the locked file is all you need to do in order to begin with unlocking it from password protection with the help of PST unlocker. The tool is built with programming capable of unlocking passwords of any length, character combination, etc. However, unlocking completely removes the password string from the PST and does not recover it back in any case. Bulk Unlocking: PST unlocker is built not just to provide unlocking of password from the data file, but also support the procedure in bulk quantity. One can process more than one protected PST files at a time without experiencing any delay or other inconvenience. Convenient UI: The user interface does not come with any complicated options, buttons, features, design, etc. Therefore, the tool becomes suitable and easily operable for users of all levels of intellect and not just the ones technically sound. Secure Processing: While the PST files are being unlocked, the application ensures they are kept secure throughout the process. The tool is built to remove the password therefore; it accesses the internals of the data file but without modifying or interfering with the rest of the data in the file. The software is designed in a very user-friendly manner with all the features that easily offers a refined password removal process that does not trouble the data within. Moreover, the tool is programmed with a technically strong backend yet easily operable user interface, which makes its usage comprehensible to all. Though the application has no as such flaws in its working or its operations but the provision for a detailed report would have added up to its potential enhancing user experience to a heightened level. Conclusion: PST Unlocker Toolkit seems like a fine application that is suitable for working out the inaccessibility of locked Outlook data files. 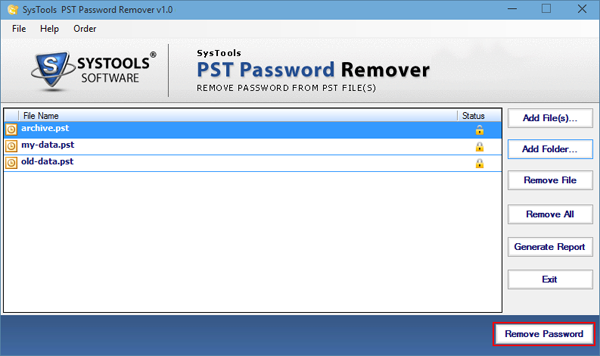 There are many similar applications but none as capable as PST Password Remover. Therefore, for its perfect working the application completely deserves a 9 on 10 both for its performance and designing/operational ease.